The Scottish National War Memorial at Edinburgh Castle houses a rich variety of artwork to honour & remember those who died in World War One. When it was built, between 1923 & 1927, over 200 professional artists worked with the architect, Robert Lorimer, to create a suitable tribute. The interior of the memorial expresses the tragic sense of loss felt by Scotland after WW1. Inside the building, there is a feeling of dignity, pride and a sense of peace. The artists and makers used different materials, including bronze, iron, wood, stone, paint as well as stained glass. The result is impressive. The artworks are designed to pay respect to the individual Scots who died, both men and women in all their different roles. Animals are acknowledged too, in the much loved stone sculpture ‘Remember also those Humble Beasts‘ by Phyllis Bone. Certainly the most colourful element of the SNWM is the is the stained glass with light flooding in from outside. In the main Hall of Honour the windows provide a lot of information, if you look carefully. For example, there is imagery illustrating what life was like on the Home Front, such as the mobilising of troops at Waverley Station (pictured top). At either end of the hall, there are windows dedicated to different military services; that is the army, the navy and the air force – land, sea & air. Other windows show the four seasons. Some of the windows have roundels illustrating the different jobs people did or technology used in the machinery of war. The windows in the Shrine are different to those in the Hall of Honour. These seven windows tell a another story, they use Bible and Christian messages to describe the experience of the War. Therefore they look more familiar to many, perhaps like traditional church windows at first glance. The artist who made all of these stunning windows was Douglas Strachan (1875-1950). Strachan was born in Aberdeen and educated at Robert Gordon’s College. He took evening classes at Gray’s School of Art in Aberdeen. He worked as an apprentice lithographer, a muralist, a portrait painter and then found a passion for working with stained glass. In 1909 he moved to Edinburgh to set up the crafts department of Edinburgh College of Art. He lived in Midlothian where he died in 1950. He worked on many other memorial windows, including a designs for the Peace Palace in The Hague installed in 1929. Following World War One the first day of remembrance conducted in Britain and the Commonwealth was held in 1919, it was called Armistice Day. Following World War Two, Armistice Day became known as Remembrance Day to include all those who had died in defence of their countries in the two World Wars. The official time and date of remembrance is 11am on 11 November. The Scottish National War Memorial was created to honour the dead of the Great War, and is found in Crown Square within Edinburgh Castle. In 1917 before the War had even ended, the idea for the memorial was suggested by John George Stewart Murray – the 8th Duke of Atholl. His idea caused a lot discussion and debate, not everyone agreed with his vision. Some people were worried it would focus too much on the military, rather than all Scots involved in the War effort. Also, after the site at Edinburgh Castle had been chosen, others were concerned it would look out of place – because of these challenges, early plans for the memorial were changed. Between 1924-7, the building was designed by the architect Robert Lorimer. He suggested an existing building could be changed and altered to form a remembrance hall. Previously the building had been used as a barracks to house soldiers. The architect worked with over 200 Scottish artists to transform the barracks into the remembrance hall & create a shrine. The memorial was estimated to cost £250,000. Therefore a lot of money that had to be raised, events like Thistle Day took place and fundraising started – for example commemorative postage stamps were issued. The public donated large sums of money in support. In August 1922 the money needed was finally raised, so construction could begin. Inside the building, the long hall has short wings and a central entrance gives the plan the form of the letter E.
The central shrine holds a large casket, which contains the Rolls of Honour. These are lists of over 150,000 names of those who lost their lives. Space didn’t allow the names of the dead to be carved in stone, so they were inscribed in books of remembrance. Today visitors can still view these books, listing the names of all Scottish casualties of World War One, World War Two & all conflicts since. It took ten years of determined work, however the Scottish National War Memorial was officially opened by The Prince of Wales, who later became King Edward VIII, on 14th July 1927. Why do you think the Duke of Atholl felt it was important for Scotland to have a National Memorial? What impression do you get from the Memorial? Why is it important that we remember? 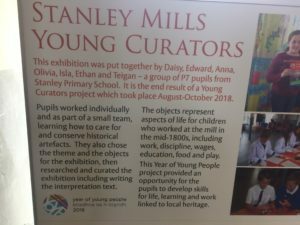 HES colleagues at Stanley Mills, a former textile mill in Perthshire, recently organized a fantastic opportunity for young people at Stanley Primary School to curate an exhibition at this historic site in a project supported Skills for Life, Learning & Work.. 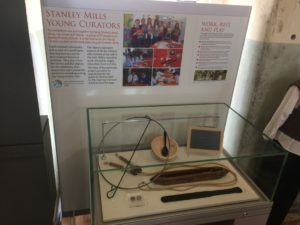 The pupils did a great job, meeting with HES curatorial and educational staff over 8 weeks to choose, document, assess, describe and display their chosen items, which included a gird and cleek, a strap (used to punish slow workers), a porridge bowl and spoon, and two shillings (the weekly wage at the Mills for children in the 1830s). The pupils displayed great skill, especially in distilling the caption for each of their objects to 25 words or fewer- no mean feat, as any curator will tell you. The results were unveiled on Monday before a select audience of parents, teachers, teaching assistants, HES staff and the pupils themselves, and as you can see below the results look extremely professional. See more of Stanley Mills on Scran here. One of the many strengths of Scran, we feel, is the diversity of our collections, the happy by-product of having such a diverse range of contributors. A picture of an 18th century cottage? It’s on Scran. David Bowie at Murrayfield? Yep, it’s on Scran. A Degas painting? Yes, we’ve got that too. In fact, we cover most subjects under the sun. Which is why, when I got a chance to go to Finland and take images of and learn about forests, I jumped at the chance. This development opportunity was created by ARCH, a Scottish body promoting cultural and heritage links between this country and the rest of Europe. My Scottish colleagues on the trip were from cultural and environmental organisations including Scotland’s Natural Heritage, Loch Lomond & The Trossach’s National Park and the Scottish Wildlife Trust. In the space of 6 days, I learned a lot about how forests are developed and managed for the benefit of wildlife, visitors, land owners and the Finnish economy; we also met with staff from Finland’s National Parks, from its hunting agency, staff from two forestry colleges and more. Through talking to my colleagues on the trip, I was able to compare and contrast forestry in Scotland with forestry in Finland; one noticeable difference between the two countries even to my untrained eye is just the sheer amount of forestry in Finland- you’re surrounded by trees, mostly pine, spruce and birch, even in cities- we visited an urban forest just outside Tampere and the forest was, literally, just outside the gardens in the suburban homes. So what, you may be asking, does this have to do with Scran? Well, we already have some forestry-related information on Scran; the Forestry Commission Scotland is one of our contributors. We also have agricultural and botanical subscribers, and many of our subscribing colleges offer vocational courses in agriculture and arboreal subjects. 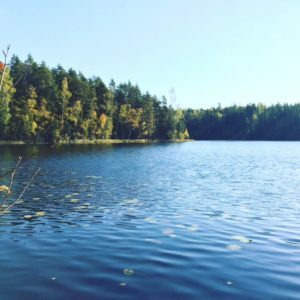 The photos I took in Finland will be uploaded to Scran in the coming weeks, and I’m sure that these will be useful to many of our subscribers. The Britain from Above website features images from the Aerofilms collection, a unique aerial photographic archive of international importance and provides access to 95,000 of the oldest and most valuable photographs in the Aerofilms collection, those dating from 1919 to 1953. Canmore contains more than 320,000 records and 1.3 million catalogue entries for archaeological sites, buildings, industry and maritime heritage across Scotland. Canmore contains information and collections from all its survey and recording work, as well as from a wide range of other organisations, communities and individuals who are helping to enhance this national resource. The National Collection of Aerial Photography / NCAP is one of the largest collections of aerial imagery in the world, containing tens of millions of images featuring historic events and places around the globe. Scotlands Places is a joint service between HES, The National Records of Scotland and The National Library of Scotland. Users can search on a place name or a coordinate to search across these collections or they can use the mapping in the website to both define and refine their search. & not forgetting Scran – we are an online learning service of the charity Historic Environment Scotland. We hold over 490,000 images and media from over 300 museums, galleries, and archives. Scran aims to advance public education by enabling access to Scotland’s culture, heritage and related material. Contributors include National Museums Scotland, National Galleries of Scotland, The Scotsman, University of Edinburgh, The Hunterian and many more. Scran is a subscription service and is free at the point of use in most schools, colleges, universities and public libraries in Scotland. Finally, we love to meet our users in person, answers questions & show you new things about our services – so if you are at the SECC, do stop by D60 for a chat. George Heriot was born in 1593 to a father of the same name. His father was a goldsmith and was descended from the Heriots of Traboun, an old and well known family in East Lothian. In 1588 George Heriot became a member of the Corporation of Goldsmiths, continuing his father’s work. He was so good at his work that in 1597 he became the goldsmith to Queen Anne, which led to him becoming the jeweler and goldsmith to King James VI only four years later. When King James became King of England, Heriot followed him to London and lived there until he died on the 12th February 1624 at the age of 60. He died a very rich man and those riches would go into building a school for the upbringing and education of the “puire fatherless bairnes” of Edinburgh. It would be named Heriot’s Hospital. The building of the school was taken on by the royal master mason William Wallace. He was a well known in Scotland as an expert for these kinds of buildings as he already had a number of notable structures to his name. He also was the main mason on the King’s Lodgings at Edinburgh Castle. But Wallace died before he could finish and the job was taken up by his apprentice William Aytoun who had assisted him on various other projects. Aytoun almost completed the building however he died at the end of the 1640’s. In 1693 Robert Mylne presented drawings to build the large octagonal clock tower. He also added a statue of George Heriot inside the quadrangle. In the early 19th century the well known architect William H Playfair added a gatehouse on Lauriston Place. He also added a terrace around the base of the main building of the school. The interior of the chapel in the south side of the main building was done by Scottish architect James Gillespie Graham in 1837. When the main building of the school was complete in 1650 it was occupied by the injured and sick troops of Oliver Cromwell until 1658 when he died. The school opened its gates to 30 more boys. This increased the number of boys living at the school to 150. In 1837 the school opened 10 ‘free schools’ across Edinburgh which educated several thousand children however they closed in 1885. A year later Heriot’s Hospital was renamed to George Heriot’s School which it has remained ever since. In the 1870’s the school paid for an institution, which would later merge with the Watt institution, to form Heriot-Watt College, a technical college, which would later become the Heriot-Watt University. In 1979 three Brannan sisters from Dalkeith became the first girls to attend the school. There are a number of children in the school, those who meet the financial and residential criteria, who still receive help from the school which offers full coverage of the costs to attend. This shows that George Heriots legacy still continues and may continue for a long time to come. Recently we gathered at Forthview Primary School in Edinburgh with Miss Watson’s P7 class, their friends & families for the premiere of the animation Forthview of the Great War. As the credits rolled we were able to reflect on the project which had brought us to this point, a project which brought together Forthview Primary School, Edinburgh Castle’s Learning Officer & the Scran Education Team. Beginning in January 2017, this project took the form of a journey through the First World War, exploring the experiences of those involved in the war, from propaganda and recruitment to remembrance. During the First World War many new recruits passed through Edinburgh Castle’s gates, experienced their first taste of military life during initial training and stood on the Castle Esplanade ready to begin their journey to the Front; sadly many never returned. The project followed the journey of these soldiers and others caught up in the First World War, reflecting on their experience. With Scran, Historic Environment Scotland’s Learning Team provided a range of interactive and cross-curricular workshops at school and at Edinburgh Castle. Pupils learned about propaganda and the methods used to encourage people to sign up or do their bit for the war and created their own propaganda posters with artist Hannah Ayre. They followed in the footsteps of the men who came to Edinburgh Castle to sign up and experienced a taste of what initial training would have been like in an immersive workshop run by Artemis Scotland. In this workshop they also took on the role of VAD nurses, learning how to put an arm in a sling and the tiresome task of rolling bandages! They learned about the realities of trench warfare through object handling at the National War Museum and reflected on those who had lost their lives during the war; visiting the Scottish National War Memorial and exploring real objects from WWI as inspiration to write their own remembrance poetry with poet Ken Cockburn and arts educator Lorna Irvine. As a culmination of the pupils’ learning journeys and to bring together and reflect on what they had learned from the workshops at Edinburgh Castle and at school, HES commissioned animator, Henry Cruickshank, to work with the pupils to create their animation. It was this animation that we gathered together to view for the first time on the 8th June. Led by Henry Cruickshank, the pupils created their own characters and story. Suitable Scran imagery was carefully selected to support the pupils’ creative writing ideas and then integrated into the storytelling. The archive imagery was used as the backdrop for their characters and pupils decided which to use scene by scene. Using stop-go animation they then brought their characters to life! Heleen Schoolmeesters, an intern working with the HES learning team, also documented the whole process in the following film. The final animation follows one character on his journey, from recruitment to training, to his experience on the battlefield. Powerful lines from the pupils’ own poetry and carefully selected words provide the soundtrack and the final scene reminds us of the families left behind and the importance of continuing to remember and reflect on those who gave their lives during the Great War. It is hoped this summary of our partnership project will inspire other groups to engage with their local heritage and learn about the experiences of people during World War One. If you are interested in developing such creative learning opportunities, please contact us – either the Scran Education Team or Historic Environment Scotland‘s Learning Team. © Imagery used in the animation comes from the following archives & collections – British Red Cross, Bruce/Leslie Collection, Glasgow City Council, Herald Scotland, Historic Environment Scotland, Lothian Health Services Archive, National Library of Scotland, National Museums Scotland, St Andrews University Library – Licensor www.scran.ac.uk. The Scran Education Officers have been spending a lot of time in Scottish schools of late. This is nothing new, you might think- Scran has always spent a lot of time in Scottish schools, usually training teachers at twilight CPD sessions in how to use our website, so that this knowledge can be cascaded down the school. Recently, though, we’ve been doing more and more interaction within school hours, directly with learners in the classroom, getting them hands-on with Scran and engaging with our archives as part of the Curriculum for Excellence. Last week our travels took us to Falkirk, where we met up with students from three different classes at two schools, Antonine Primary and Denny Primary. Both schools are currently studying ScotJam- we were none the wiser until the teachers told us the abbreviation stands for Scotland/Jamaica- and exploring the many links between their home country and the Caribbean island. We spent a fascinating morning and afternoon with the children as they pored over the Jamaica-related materials on Scran. We found images of the Jamaican flag, and noted its similarity to the Scottish Saltire. This is apparently not a coincidence. The flag was designed in part by Rev William R.F. McGhie, a Scottish Presbyterian minister located in Jamaica at the time of its independence from the UK. We stumbled upon numerous Scran images of Jamaica Street in Glasgow, and noted the presence of similarly-named streets in Edinburgh and Aberdeen. Conversely, we discovered that there is an Edinburgh Castle in Jamaica. Much of the students’ research centred on slavery, one aspect of the ScotJam topic that seemed to particularly resonate with the classes, and which touched on Curriculum areas such as history and citizenship. There are many Scottish connections with the slave trade, and we explore some of these on Scran, as well as looking at the lives of people who were connected with, or opposed to, slavery such as David Livingstone, Josiah Wedgwood and George Moncrieff. Many thanks to Mr. Farrington and Ms. King at the two schools for arranging the Scran visit, and we look forward to working with you as you continue to explore Scotland’s links with Jamaica. Slamannan Primary in Falkirk yesterday celebrated its 140th anniversary, having opened in September 1876. It is the oldest school in Falkirk, with nearby Limerigg Primary, which also celebrates its anniversary this year, a close second. Scran attended the school’s celebrations, which included a morning of Victorian-style lessons, a Victorian school lunch of mince and tatties, and an afternoon assembly in which various classes recited Victorian nursery rhymes and songs and updated us on the work that they had been doing in preparation for the school’s anniversary year. The contrast between 1876, when children were to be seen and not heard, and 2016, where pupils were an active part of the learning process, and their feedback and participation welcomed and valued, was striking. Guest speakers remembered Slamannan’s history, and spoke of a typical day at a Victorian school, much of which seemed to involve punishment! Tea and cake were served afterwards, and visitors, who included many former pupils, perused old school photos as they tried to identify former classmates. The children’s hard work was evident, from the Victorian plate decorations to the images of famous Victorians on the walls, and the fact that every pupil and teacher dressed up in Victorian costume really added to the atmosphere of the day. Scran is planning to work closely with Slamannan this year as they investigate the past and look to the future, so watch this space. And if you’d like us to come to your school and work directly with your classes on any topic at all (not just Victorians), drop us a line. Did you know that Books for All is powered by Scran? Accessible Curriculum Materials for Students with ASN. So, what is BfA about? – Books for All is about making accessible learning materials available in alternative formats, for people who have difficulty reading traditional printed books. In Scotland, Books for All provides books in accessible formats for pupils who have difficulty with ordinary printed text, including those with dyslexia, who have a physical disability or who are blind or partially sighted. Where does Scran fit in? – Scran supports the Books for All service by providing the background database system which hosts the reading materials and online content, This is regularly added to and updated.For example, within the last month new study materials from Hodder have been uploaded; National 4 Physics and Higher for CFE Business Management SQA papers. Also, recorded narration of “Heiroglyphics” by Anne Donovan – as well as books by Iain Crichton Smith; “The Red Door“, “The Telegram” and “Mother and Son” in MP3 format. As you can see there is quite a range on offer. These resources are Accessible Copies of copyright books and works. They are shared under the terms and conditions of the CLA Print Disability licence. It’s easy to get your digital hands on all of the above, login here. Alternatively, if you are a teacher in Scotland, you can find both Books for All & Scran in the Glow App Library, where you can add them your Glow Launch Pad. If you have any further questions, you can also contact us.